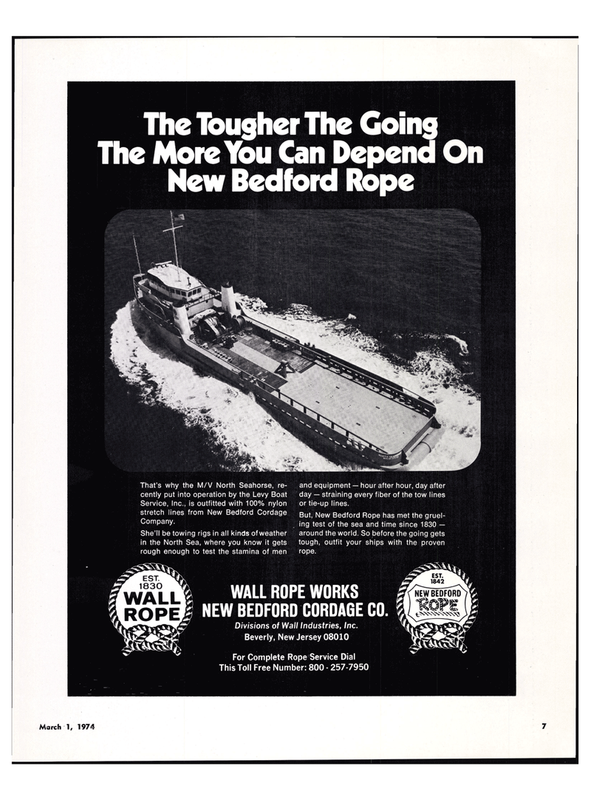 She'll be towing rigs in all kinds of weather in the North Sea, where you know it gets rough enough to test the stamina of men h, WALL ROPE WORKS | NEW BEDFORD CORDAGE CO.
P Divisions of Wall Industries, Inc. This Toll Free Number: 800 - 257-7950 and equipment — hour after hour, day after day — straining every fiber of the tow lines or tie-up lines. But, New Bedford Rope has met the gruel- ing test of the sea and time since 1830 — around the world. So before the going gets tough, outfit your ships with the proven rope. New Jersey North Sea Levy Boat Service Inc.